Wow: it’s all simply gigantic! The giggles. The suspense. The top author. The cool fold-out surprise. The thing making that HUGE ROAR… Is that you, roaring with laughter? Nope, it’s A BIG SCARY BEAST COMING THIS WAY. YIKES! 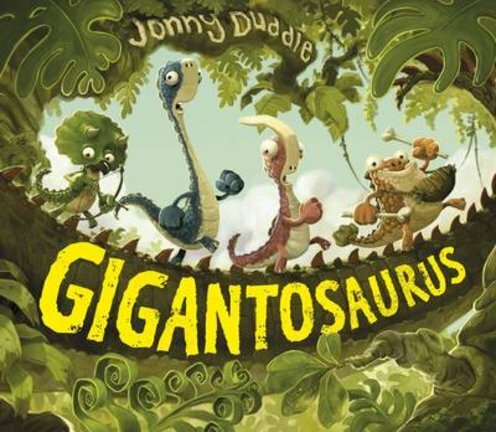 All the small dinos know to beware of the Gigantosaurus. But like a certain boy who cried wolf, one little dino thinks it’s funny to pretend the Gigantosaurus is nearby. That is – until he really arrives in his own massive gatefold section. Stomp, roar, crunch – burp! Thanks for lunch… If you loved The Pirate-Cruncher, you’ll go wild for this stomping dino delight.